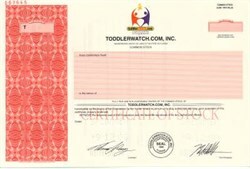 Beautifully engraved RARE SPECIMEN certificate from Toddlerwatch.com, Inc. This historic document was printed by the Security-Columbian Banknote Company and has an ornate border around it with a vignette of the company's logo. This item has the printed signatures of the Company’s Chairman ( Thomas J. Lang )of the Board and President. 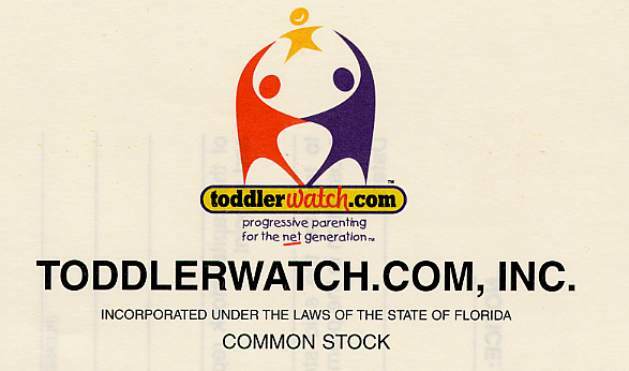 Toddlerwatch was created in early 1999 as an internet-based company to serve the families of young children. By combining the latest technologies and comprehensive parenting information, we strive to provide a premier parenting portal through the array of services and information we provide, including childcare facility internet monitoring, pediatric advice, products, and safety information.